The annual grape harvest from mid-March to mid-May is the time of year winemakers get very little sleep, in fact many grab little bits of sleep on the floor, or a couch in the staff room at the winery when they can, and that’s the case for winemakers, Gary and Valley Neale, from Brightwater Vineyards in Nelson. 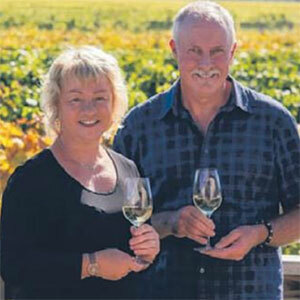 Brightwater Vineyards is a winery going from strength-to-strength as a premium Nelson producer based on making a range of excellent wines, wines produced without compromise in everything they do, from vineyard management right through to bottling and labelling quality is paramount to this couple. The result of the efforts Gary and Valley along with their viticulturist Dale and winemaker Tony are stunningly good wines at very affordable prices. If you need proof of quality before you buy know that they have won trophies at various shows for most varieties they produce including a champion Wine of Show trophy for the Brightwater Vineyards Lord Rutherford Barrique Fermented Chardonnay and the hotly contested Pinot Noir Trophy at the Air New Zealand Wine awards in 2015. The quality needed to win these trophies carries through to every wine they produce, no compromise on the small details ensures great quality in the finished product. Brightwater Vineyards is also one of the premium local wineries the Grocer at Fresh Choice Nelson has an excellent relationship with, the quality of Brightwater Vineyards wines means he can buy them with confidence to put on the shelf knowing you, the customer, won’t be let down when you choose a bottle. Brightwater Vineyards wines are beautifully hand-crafted and are packed with pure, delicious varietal flavours meaning you can choose them with the same confidence the Grocer has.